The evolution of wrinkle fillers has led to a groundbreaking product called Sculptra Aesthetic. But Sculptra is actually not a filler; rather, it is a volumizer. It works by replacing natural volume that is lost as we age. The Sculptra is also known as poly-L-lactic acid that, when injected, stimulates the body to produce its own collagen. This is one of the major benefits of Sculptra – the volume is all your own! This is apparent by the natural results that can be obtained with Sculptra. Many people don’t realize that the loss of volume is often the most noticeable signs of aging in the face. And it is important to understand that a facelift does not restore volume. Volume is the cardinal sign of youth, which is why a volumizer is so effective in restoring contours and rejuvenating the face. Some of the more important areas to contour are the cheeks, temples, and lower face. Among Sculptra’s many advantages is the long duration of the results, shown to be often longer than two years. But to consistently achieve long-lasting, natural results requires an injector experienced in using a volumizer like Sculptra. 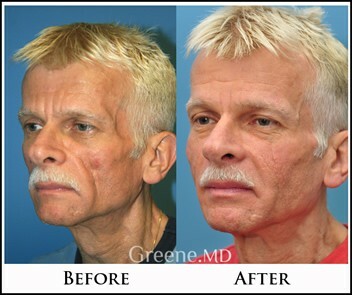 Dr. Greene spent years investigating aging and the anatomy of the face, and refining his unique Sculptra treatments that are an effective alternative to a fat injections. He has also found that Sculptra helps to maintain results in patients who have previously had aging face surgery. Dr. Greene's schedule for appointments fills up approximately 2-3 months in advance. Please give our office a call to schedule at 954-651-6600. If you wish to be seen sooner, you can be added to our appointment waiting list, but a sooner appointment with him cannot be guaranteed. "...My procedure involved Sculptra, a filler for the facial area. I am not a fan of needles but the discomfort level was minimal. Oh, and the results, in my case, were quite impressive and do I even dare to say miraculous?! As a result, my self-confidence has taken a huge leap forward. Would I recommend Dr. Greene to others? Absolutely. It’s written all over my face.-AZ"
Sculptra is also known as poly-L-lactic acid, which is used safely in a number of other medical applications. The poly-L-lactic acid stimulates the tissue to produce its own collagen, naturally adding volume to the face. The benefit is that the added volume is actually the patient’s own tissue. The areas treated depend on areas of deficiency and the judgment of the treating physician. Virtually anyone with volume loss in his or her face is a candidate for treatment with Sculptra. Sculptra is also an excellent choice for augmentation of the cheeks, chin, or temples. However, Sculptra can also improve the nasolabial folds and other areas of the lower face. Patients of all age groups can benefit from Sculptra treatment, but those with more significant skin laxity and volume loss tend to require additional treatments. Many patients choose to undergo treatment with Sculptra as an alternative to surgery, in order to avoid anesthesia and potential complications. WHAT CAN I EXPECT WITH A SCULPTRA TREATMENT? Dr. Greene’s specially formulated topical numbing cream is applied for 15 to 20 minutes prior to treatment. The treatment takes approximately 15 to 30 minutes to perform. The treatments involve very small needles, and are virtually painless due to the numbing cream and Dr. Greene’s gentle injection technique. Dr. Greene also adds lidocaine (an anesthetic agent) to the Sculptra prior to treatment, which further enhances comfort. Following treatment, he then massages the area to ensure that it is properly distributed. Patients may return to normal activities immediately after treatment. Sculptra is an injectable material made up of poly-L-lactic acid that is reconstituted in sterile water prior to treatment. After injection, it stimulates collagen production to restore volume to the face. It is particularly well suited for restoring volume and contour in areas such as the cheeks, temples, and chin. WHAT SHOULD I EXPECT AFTER A SCULPTRA INJECTION? Because the increased volume is due to collagen production, the improvement in appearance is gradual and occurs over 4-6 weeks. The restored volume can last up to 2 years, or even longer. Some patients will benefit from additional treatment sessions if more correction is desired. The majority of patients can resume their daily activities immediately after treatment. IS THERE ANY DOWNTIME AFTER A SCULPTRA INJECTION? WHAT ARE THE COMMON SIDE EFFECTS OF A SCULPTRA TREATMENT? Side effects are generally minor, such as mild swelling or bruising, and can be easily concealed with makeup. Avoiding certain medications and supplements, such as baby aspirin and fish oil, can minimize bruising. 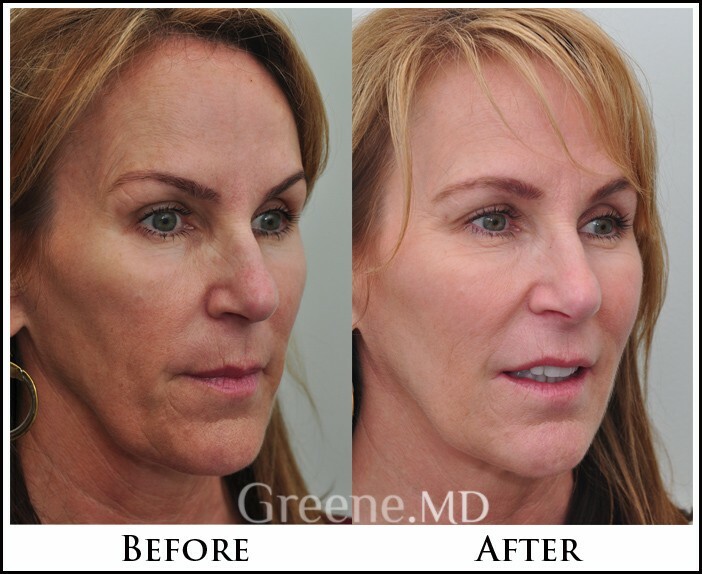 To learn if Sculptra is right for you, Dr. Greene will perform a thorough consultation. 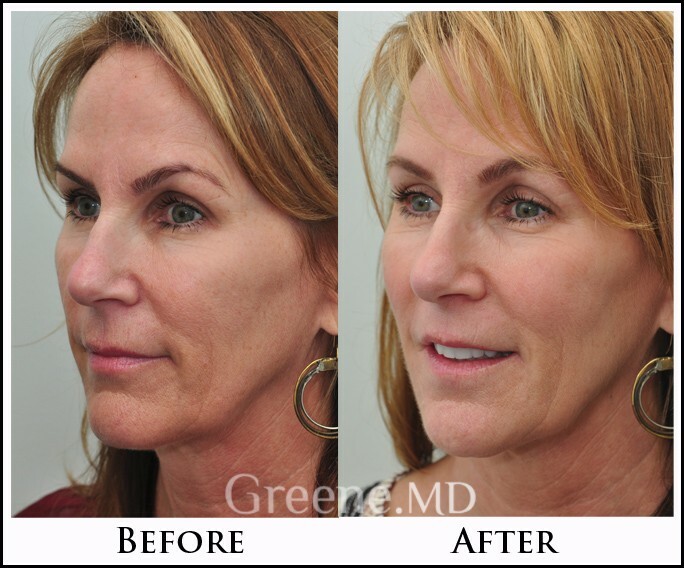 Dr. Greene has experience with a number of different fillers, and will select the best filler or volumizer combination for you. DOES SCULPTRA REQUIRE ANY SPECIAL TRAINING OR EXPERIENCE? All facial fillers require extensive experience in order to achieve the absolute best results. Use of a volumizer such as Sculptra requires experience, expert judgment, and advanced understanding of facial anatomy. ARE THE TREATMENTS WITH SCULPTRA PAINFUL? Patients usually report only minimal or mild discomfort during treatment. Dr. Greene uses a specially formulated numbing cream that alleviates most discomfort. He also mixes lidocaine with the Sculptra to enhance patient comfort. CAN SCULPTRA BE COMBINED WITH OTHER FACIAL FILLERS? Sculptra can often be combined with other facial fillers. 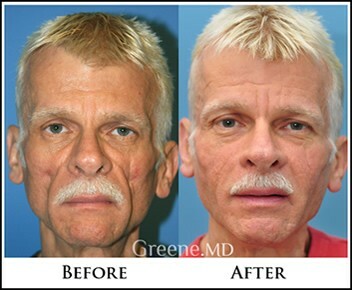 In fact, Dr. Greene often uses different fillers for the same patient in order to achieve a more natural result. Sculptra is well suited for many areas of the face, such as the cheeks, but is not ideal for certain areas like the lips or the tear trough (underneath the eyes). WHAT AGES ARE MOST APPROPRIATE FOR TREATMENT WITH SCULPTRA? Any patient with deficiencies in areas such as the cheeks or temples could benefit from treatment with Sculptra. Patients with early fat volume loss and better skin elasticity often need fewer sessions, and often only one treatment. On the other hand, patients with more advanced aging typically require additional treatment sessions to achieve optimal correction.